BottlesUp bottles are fun and safe to drink from––glass is the purest, and healthiest material to use for beverages. BottlesUp glass water bottles are free of known toxins including Bisphenol-A (BPA), phthalates, Polyvinyl Chloride (PVC), and polycarbonates, which research has shown can compromise human health. Unlike other portable water bottles, glass does not leave lingering odors, residue or buildup. And, you can see what’s in there. The midsection taper and silicone rings provide “gription” allowing an easy, comfortable grasp of the bottle. 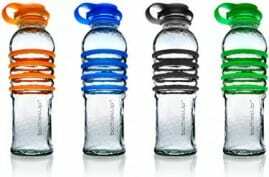 The sturdy design of a BottlesUp glass water bottle ensures it can handle the everyday tumble. Glass is the environmentally responsible choice. Our glass bottles are sourced and made in North America using a minimum of 75% post-consumer recycled glass (sourced on-site) by skilled glass craftspeople in Mexico. Our food-grade silicone accessories are produced in Maine. Every order is delivered in environmentally responsbile and minimal packaging that you can easily recycle. There is NO plastic in the product or the packaging, a commitment to both health and the environment. This dedication to creating a truly green product gives BottlesUp the lowest carbon footprint in the industry. Our bottles are designed by an architectural glass artist and are handcrafted using ancient techniques in a modern facility. Using recycled glass, the semi-automatic process gives each bottle it’s own texture and brilliance––something not found in fully-manufactured bottles.